The main idea in this project is to develop a stand-alone circuit board and code that controls several (up to 32) RC servo motors. The board is intended to be used for robots or other electromechanical devices requiring a relatively large number of RC servos. The board is stand-alone, meaning that it can be programmed directly using standard tools for Atmel AVR development, and does not require commands from an external board, such as an Arduino or a Raspberry pi. 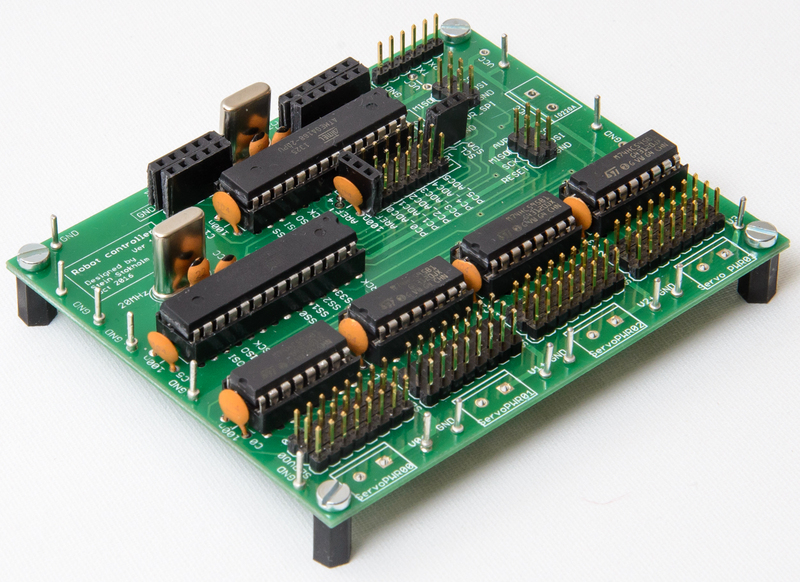 Most similar boards in the market is based on being controlled by another board, such as an Arduino or a Raspberry pi. The board itself receives commands from other boards, and adjusts the RC servos accordingly. This project develops a board that itself can be programmed as a stand-alone robot controller, and is not dependent on an external board to control it. The learning experience of creating a relatively complex board from scratch. This project is based heavily on fairly advanced precision timing of a microcontroller. Furthermore, skills within several important aspects of microcontroller design is required; serial communications, interrupts, combination of C and assembly, as well as functions related to robot programming. Hardware and software for generating 32 servo control pulses verified to work on simple loops. Make reduced versions for specific purposes.